Kingfisher can provide the ideal marine sanitation solution to your boat toilet and marine waste treatment needs. 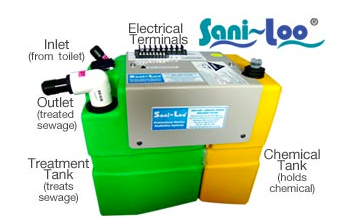 The system is manufactured and designed in Australia by Sani-Loo Pty Ltd. It has been designed for the purpose of overcoming many problems in existing systems such as being too bulky, high prices and malfunctioning electronics. The Sani- Loo ® sewage treatment, marine sanitation system treats macerated toilet waste as it enters thetreatment tank. A chemical is added to the treatment tank that sanitises the waste to 99%. The waste is then pumped directly overboard in most areas or to a holding tank (if in a nil discharge area) ready for discharge overboard when the vessel is in an area where treated sewage can be discharged. The alternative is to empty the holding tank at a marina pump out. Holding tanks need to be vented correctly for odour free containment. The marine sanitation system will connect to electric macerating toilets. If you have an electric toilet installed, it will be simple to connect the Sani- Loo®. If you are looking for a relibale marine sewage treatment system with easy functionality, compact design and sensible pricing, then you have come to the right place.